Cauliflower is all the rage right now. But not everyone is a big fan. This version is guaranteed to please the pickiest eater. Packed with healthy turmeric and Vitamin C (anti-inflammatory) and a punch of potassium (helps lower blood pressure), it's a great option for a side dish or appetizer. You could even use as a filler for a wrap or for vegetarian Indian-inspired tacos! The Indian spices in this recipe can be bought at your local Indian store or grocery store. Place shredded coconut, almond meal and all the spices in a bowl. Mix well. Pour coconut milk into another bowl. Prep a baking sheet with aluminum foil and pre-heat oven to 350 degrees. 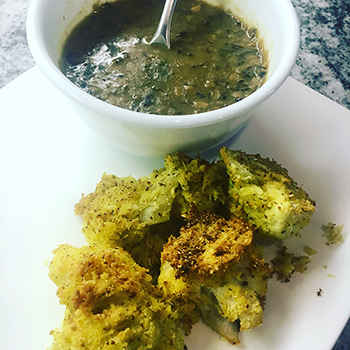 Dip cauliflower pieces in coconut milk and then place in dry ingredient mixture to coat them. At very end, place on broil for a few minutes, watching closely to only brown the cauliflower and not burn it.